I reserved Girl Walks into a Bar at the library after hearing a good review of it from another Cannonballer. I had kind of mixed feelings about it at first, as it wasn’t exactly the story I had been anticipating, but my husband read it after me and said that he found it “strangely compelling.” We actually had an interesting discussion about some parts of that book, and a month after finishing it I find it has really stuck with me. Dratch, whose performance as Sheldon on SNL never failed to make me giggle, opens her book with a pretty frank discussion of her life and career around the time her role on Tina Fey’s 30 Rock changed and then ended. It was insightful and wry and funny, and reminded me quite a bit of Fey’s Bossypants, particularly those sections also dealing with the creation of 30 Rock. However, soon after the opening chapter, Dratch’s book took on a less funny but more personal nature, focusing less on her work and more on personal life. 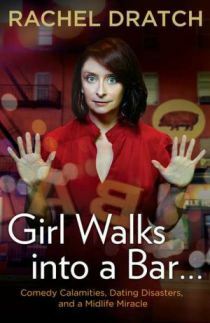 There are certainly funny moments in Girl Walks Into a Bar, but the book talks quite a bit about Dratch’s romantic relationships, and how her life just seemed to change in tone once her career kind of stalled and she approached 40, unmarried and childless. It seemed heartfelt and honest. I haven’t had the same experience, having married and had children when younger, but her worries about her career and how her life is progressing felt disturbingly familiar to me. To me, it seems like she learned to live with uncertainty to some extent, which is probably a good lesson to have learned and one I wish I was a bit better at embracing. I am glad she found so much happiness, and I wish I could see more of her television. Dratch is really charming and self- aware in this book, and I really enjoyed it.